From left: Mitchell Maki of Go For Broke National Education Center, Rick Noguchi of JANM, Gary Mayeda of JACL, and Guy Aoki of MANAA. 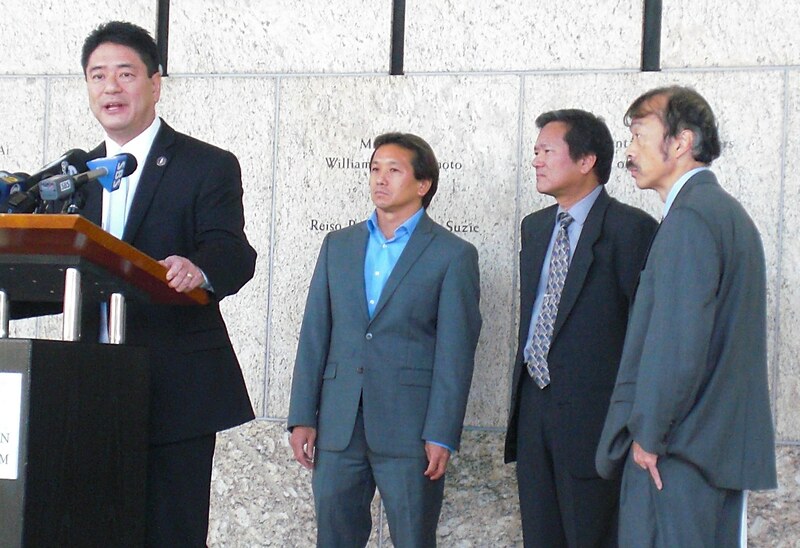 Representatives of Los Angeles-area Asian American community organizations held a press conference Nov. 1 at the Japanese American National Museum to denounce the Houston Astros’ Yuli Gurriel’s racist gesture toward the Los Angeles Dodgers’ Yu Darvish as well as the Major League Baseball commissioner’s decision to delay punishment until next year. They also suggested proactive steps so that something positive might come out of this incident. In Game 3 of the World Series in Houston, first baseman Gurriel got a hit off pitcher Darvish, who is from Japan. Upon returning to the Astros dugout, Gurriel used his fingers to slant his eyes and mouthed “chinito,” a Spanish term that many Asians regard as derogatory. Commissioner Rob Manfred decided to allow Gurriel to continue to play in the World Series and imposed a five-day suspension without pay in 2018. “Obviously, World Series games are different than regular-season games, and I used my best judgment as to where the appropriate disciplinary level fell,” Manfred said. “The feeling of many in our community is that if a player had made a racist gesture aimed at an African American, he would likely have been suspended immediately, World Series or not. In fact, there has been a precedent of suspending a player in the middle of the championships … When Draymond Green made a flagrant foul by touching his opponent’s groin area, he was suspended in Game 5 of the 2016 NBA Finals. “Many of us grew up with racial taunts and non-Asians pulling back their eyes to racially mock us. Manfred’s cop-out decision sent the message to the public that what Gurriel did wasn’t that big a deal. In fact, when the player was announced before the start of Saturday’s game, he received a standing ovation from the 40,000 gathered at Minute Maid Park. When asked to explain himself, Gurriel said that “chinito” is a common word for Asians in his native Cuba. Aoki pointed out that Gurriel later admitted that he knew from playing baseball in Japan that “chinito” was considered offensive, and that he didn’t address the “slanted-eye” gesture at all. “His words are not those of contrition, but of someone who was caught making an obscene gesture and forced to apologize,” Aoki added. According to Aoki, the same gesture was made by the Spanish Olympic men’s and women’s basketball teams in 2008 just before they left for Beijing; by singers Miley Cyrus and Joe Jonas in 2009; and by the Serbian national women’s volleyball team last May upon learning they would be going to the 2018 Women’s World Championship in Japan. “While Commissioner Manfred said Gurriel would have to undergo sensitivity training before the next season, we suggest a more proactive approach,” Aoki said. “Make all Major League players go through sensitivity training, not just those who’ve already offended people. Rev. Tim Yee of Union Church holds up a photo of congregation member Hagi Kusunoki, whose husband helped rescue the “Lost Battalion” of Texas. 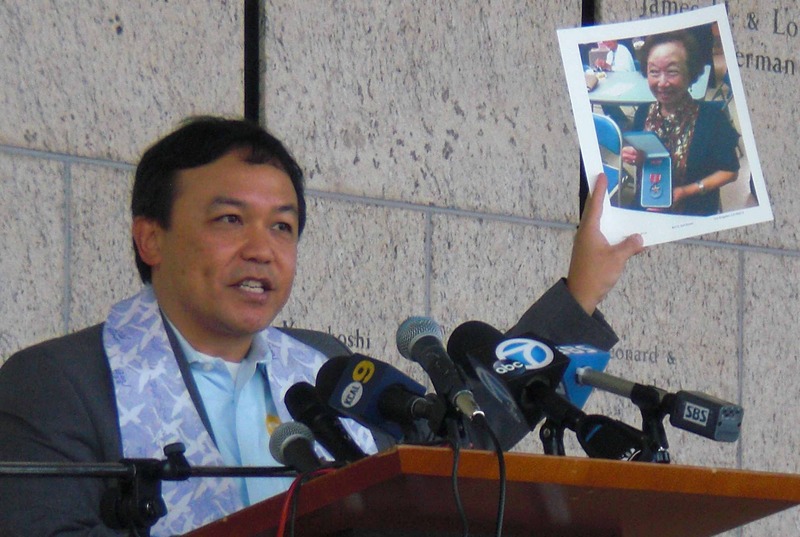 Yee held up a photo of Hagi Kusunoki, a member of his congregation. Her late husband George was posthumously awarded a Bronze Star for his service as a member of the 442nd Regimental Combat Team during World War II. Outnumbered four to one, he and his comrades — hundreds of whom were killed or wounded — rescued a Texas battalion that had been surrounded by Germans in a forest in France. “Hagi and George made incredible sacrifices for their country so that we would always remember the pain and injustice that racism can lead to,” Yee said. “So when 40,000 fans give a standing ovation to Yuli after being cleared to continue playing in the World Series, I think that Hagi’s story has been forgotten. “For why would any good American cheer the overlooking of blatant racism against Asians when great Americans like Hagi and George have sacrificed so much that our country could be united? It must be that good Americans in Texas, California and our whole nation have simply forgotten how much we have already suffered because of turning a blind eye to racism. “Win or lose tonight, we are asking Yuli Gurriel to help the Asian American community and our whole country to move forward by accepting our invitation to meet with us and learn more about the Asian experience in America. We are not saying Yuli is a bad person, and in fact we believe he has an incredible opportunity to take something very bad and have something very good come out of it. “Like thousands of other kids that look like me, this was their first experience of what racism feels like. And it didn’t feel good. “Mr. Gurriel may not have meant any harm, but that is what kids said to me. Mr. Gurriel’s self-proclaimed intent doesn’t make it okay. Addressing Manfred directly, Mayeda continued: “Your audience is not just the players or the players’ union. They are more than the fans in Los Angeles or Houston. The people you most want to teach the good lessons of baseball are the Little League players. They watch the MLB players, umpires and of course what they do and how they are disciplined. “The decision affects kids both Asians and non-Asians everywhere. My friend Peggy Kamon-Mato this weekend was met by strangers who pulled the slant-eye gesture to her in front of her young daughter. I blame the lack of immediate suspension by Commissioner Manfred as a green light for strangers to send racist gestures to mothers and kids. This is not an isolated incident and is increasing as people come forth to share their stories on social media. “Baseball is an opportunity to teach our youth sportsmanship, strategy, teamwork and even math. Baseball welcomes players from every country to play for their favorite team in the U.S. This field of dreams is a lesson in classic Americana that is taught in every town big or small, urban or rural. Baseball is a test of skills but more importantly it is a test of character and respect. Mitchell Maki, president and CEO of Go For Broke National Education Center, said that he was heartened by two subsequent incidents: “At the beginning of Game 4 in the Dodger dugout … the players were chanting and cheering and jumping up and down, and in the middle of that huddle was Yu Darvish … They said to him, ‘We’re going to win this game for you’ … The Dodger players in that moment understood that this was more than just baseball, this was about a human being insulted and being stereotyped by another person and that was wrong, and that they found it in their hearts to do something about it. “Last night in Game 6 as the World Series returned to Dodger Stadium, in the second inning as Yuli Gurriel approached home plate for his first at-bat, the crowd rained boos energetically and enthusiastically upon him … The person who controlled the pace of the game … was the pitcher, the man on the mound … That man was Rich Hill, and in that moment what Rich did was to step off the mound, walk away … and allow the crowd to voice its displeasure for another 15 or 20 seconds. Because Rich Hill understood what happened to his friend, his teammate, on a very human level. Statements critical of Gurriel and Manfred were also issued by Korean American Coalition of Los Angeles and Latino Coalition of Los Angeles.